"I say, I wonder what's going to happen exciting today?" Answer, "Very little here." It's a pleasant story, well-told, but our tiny family agreed it's missing something. Originality? Pluck? Sunlight? It feels rather paint by number, and though "heart" is mentioned several times, it doesn't really include all that much heart. I had heard prior that, "If you cried in Toy Story when Andy disposes of his box of toys, well, you're unlikely to cry here," and I think that about sums it up. 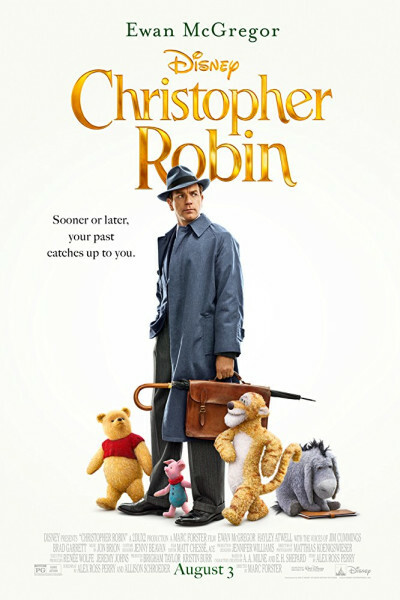 I absolutely ADORE Pooh, and have a number of Milne's books in my collection, but Christopher Robin (despite all its puppeteering and parroting) fails to evoke nearly the same level of emotion. In fact, in the climactic scene, I found myself thinking, "Gosh, this is Elf's storyline, and Hook's...."
Yep. Knew that. What of it?